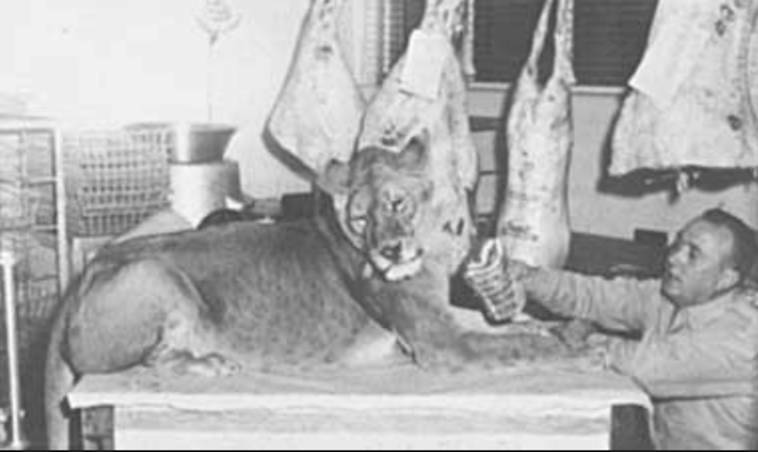 This particular big cat, in her prime and perfect health, chose a more gentle way of life, vegetarian! Little Tyke's story spread in Great Depression-ravaged America, giving spiritual hope and renewed faith to people from all walks of life. The Westbeaus took the three-pound 'Little Tyke' to their Hidden Valley Ranch near Seattle and there it joined the menagerie of other animals including horses, cattle, and chickens. Curious peacocks lined the housetop, kittens peered through a picket fence, and two terriers danced with joy for the new addition to the household. Drinking bottles of warm milk, Little Tyke began the long road to recovery. A well meaning friend suggested mixing beef blood with milk, in increasing proportions. Given milk containing ten drops of blood, Little Tyke would have nothing to do with it. They mixed in five drops of blood, and hid that bottle. As she sucked on the plain milk they quickly switched bottles. Again she refused it. In desperation they added *one* drop of blood to a full bottle of milk, but Little Tyke refused this bottle as well, and they could only stare in amazement. 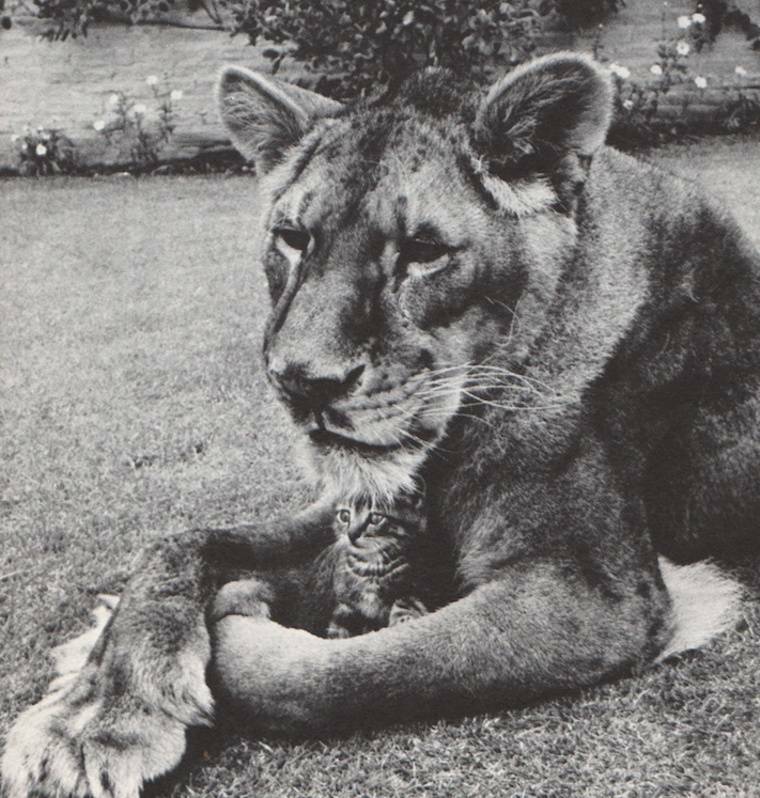 Little Tyke had many close animal friends. Her favorites were Pinky (a kitten), Imp (another kitten), Becky (a lamb) and Baby (a fawn). You Asked For It, the popular television show hosted by Art Baker, once featured Little Tyke. The producers wanted a scene with chickens, which didn't bother Georges since Little Tyke roamed easily among chickens at Hidden Valley Ranch. When the film crew brought the chickens in, they turned out to be four little day-old chicks! Instantly her mouth opened and a little chick popped out, unharmed. Flapping its little down-covered wings, it almost flew back to its upset mother. Apparently Little Tyke had affectionately licked the tiny chick, as she was prone to do when, with one huge slurp of the tongue, the little chick had popped into her mouth, and she hadn't known how to fondle it further! With the amazed camera crew filming, Little Tyke strode over to the chicks, hesitated long enough to lick the chicks *carefully* and *gently* with the very *tip* of her tongue, and moved away with a yawn. A moment later she came back to lie down among the chicks. They immediately made their way into the long silky hair at the base of her great neck where they peered out from the shelter of their great protector. Another scene saw a new kitten, after an introduction, walk over to Little Tyke's huge foreleg and sit down. Little Tyke crooked one paw around the tiny creature and cuddled it closer. In front of cameras, Art Baker picked up the Bible and read: 'The wolf and the lamb shall feed together, and the lion shall eat straw like the bullock.' Mail poured into the producers, making this episode one of the most popular in the show's history. Unfortunately, while spending three weeks in Hollywood for the show, Little Tyke contracted virus pneumonia, a disease that took her life a few weeks later. The sudden change in climate may have been a contributing factor. She succumbed quietly in her sleep, retiring early after watching television. Her life is over, but her teachings live on. Of the many lessons she taught, not the least is that love removes fear and savagery. Little Tyke reflected the love and care shown to her after the first few moments of her precarious birth. Thousands saw photographs of her with her lamb friend, Becky, inspiring many to see the world a fresh way: two such diverse natures enjoying each other's love! Her favorite and closest friend, however, was Becky, a lamb who preferred Little Tyke's company to any of the other animals. One eminent attorney kept a huge enlargement of this photograph in his office, and pointed to it as he counciled couples on the verge of divorce. Science is at a loss when it comes to Little Tyke. Felines are the strictest of carnivores. Without flesh she should have developed blindness, as well as dilated cardiomyopathy (DCM), a degenerative disease that turns heart muscles flabby and limits their ability to pump blood. This is because her diet didn't contain an adequate source of the amino acid, taurine. Little known in the 1950's, subsequent research at UC Davis in 1976 proved that taurine is an essential nutrient for felines, the lack of which would cause degeneration of the retina. Later research implicated inadequate taurine levels in dilated cardiomyopathy (DCM) as well. For cats with DCM, if the disease has not progressed too far, administering taurine causes an almost miraculous recovery. Formerly, cats lived only a few days to weeks after diagnose. Taurine is nonexistent in natural non-animal sources. It is present in minute amounts in milk and eggs. Little Tyke could have gotten her taurine requirement from milk, if she drank 500 gallons per day, or from eggs, if she ate more than 4000 per day. How *did* Little Tyke get taurine? Perhaps even more important, why did Little Tyke disown her species' instincts? Little Tyke is a curiosity to the public, aberration to zoologists, anomaly to scientists, and an inspiration to idealists. Tyke seems to fulfill the Biblical prophecy "The wolf also shall dwell with the lamb, and the leopard shall lie down with the kid; and the calf and the young lion and the fatling together; and a little child shall lead them." (Isaiah 11:6). 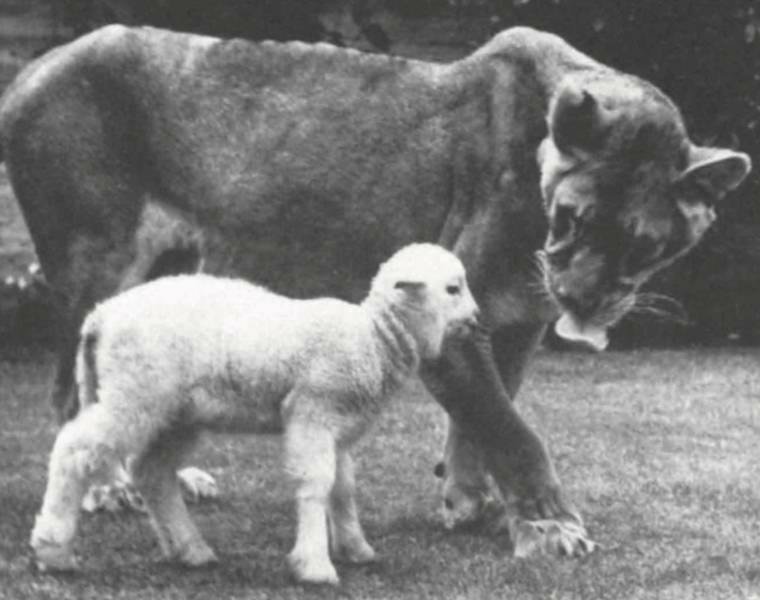 To condition her stomach, Little Tyke would spend an hour at a time eating the tall grass in the fields - another striking reminder of the prophecies of Isaiah 11:7 and 65:25, "ï¿½ the lion will eat straw like the ox." Little Tyke had an exceptionally gentle and loving nature, and all animals on the farm came to be petted by her without any fear. Little Tyke's story spread in Great Depression-ravaged America, giving spiritual hope and renewed faith to people from all walks of life. She was taken on tour to be shown to a public desperately hungry for love and innocence.